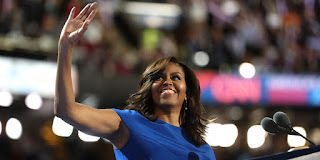 The former first lady has insisted that she has no interest in holding the highest office in the land. Michelle Obama and Oprah Winfrey have a few of things in common. They're both charismatic women who can captivate a crowd with their words, they have both inspired a groundswell of support for one-day presidential runs and they have both been adamant that they have no interest in taking on the highest office in the land. Yet the will-they or won't-they buzz about both women continues. So, for her part, Obama has once again set the record straight. "And you just can’t say, ‘Well you’re a woman, run,'" she continued. "We just can't find the women we like and ask them to do it, because there are millions of women who are inclined and do have the passion for politics." And despite her past role at the White House, she simply does not. "I've never had the passion for politics," Obama insisted. "I just happened to be married to somebody who has the passion for politics, and he drug me kicking and screaming into this arena." For Winfrey, the talk of a potential presidential run began after she delivered a powerful speech while accepting the Cecil B. DeMille Award at the 2018 Golden Globes. For Obama, it started almost two years earlier after her inspiring speech at the Democratic National Convention. But according to Obama, that ability to energize an audience with a moving address shouldn't be the standard by which presidential candidates are picked. "Just because I gave a good speech, I'm smart and intelligent doesn't mean I should be the next president," she said plainly. "That's not how we should pick the president. That's been our problem. We're very shortsighted about how we think about selecting the commander-in-chief." And no matter who is selected the next time the job is up for grabs, the one thing she's certain of is that it won't be her.